While most girls received a cute outfit, a stuffed bunny, or some fancy talking toy on her 1st Birthday –- I got a sister. Yep. Exactly one year (to the day) of my birth, my sister entered the world and I met my built-in best friend. For the longest time our youngest brother, Adam, thought that we were “turtle twins,” which was his way of trying to say fraternal twins…which we are neither. =) Growing up we shared everything from our room, to our musical tastes, and the latest fashion trends. (Even if we did wear shell necklaces and surf apparel while living in freezing Wisconsin and YES that “Summer Highlighting Foam” streaked our hair bright orange.) When we were little we’d have a couple of friends over each year to celebrate our Birthday with Lisa Frank themed party favors or a Hello Kitty banner. The first time we celebrated without each other was when I turned 21 and road-tripped to St. Louis to see a concert. Since then we always try to celebrate together, and this year was no exception. After much deliberation we settled on going to see the Milwaukee Brewers play the St. Louis Cardinals and invited some peeps along. Me, wanting to have my makeup fun and new for every different occasion, sat down at the computer and typed in “Brewers Eye Makeup” on Pinterest. I hit the search button and nothing came up. 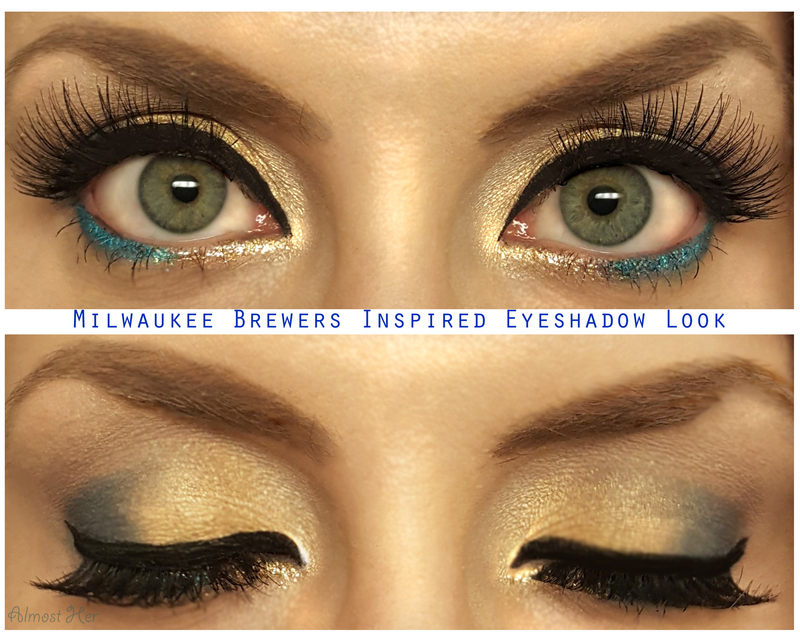 It wasn’t until I was at Target and saw this little $2 eyeshadow duo that happened to be gold and blue when inspiration hit, so below I have my Brewers Inspired look. My new Brewers shirt my sister got me as a Birthday present was the perfect addition to this! While I realize that not everyone wants to dress up their makeup for a baseball game, I do believe wearing team colors completely raises team spirit, so have fun with it! Not a baseball fan? 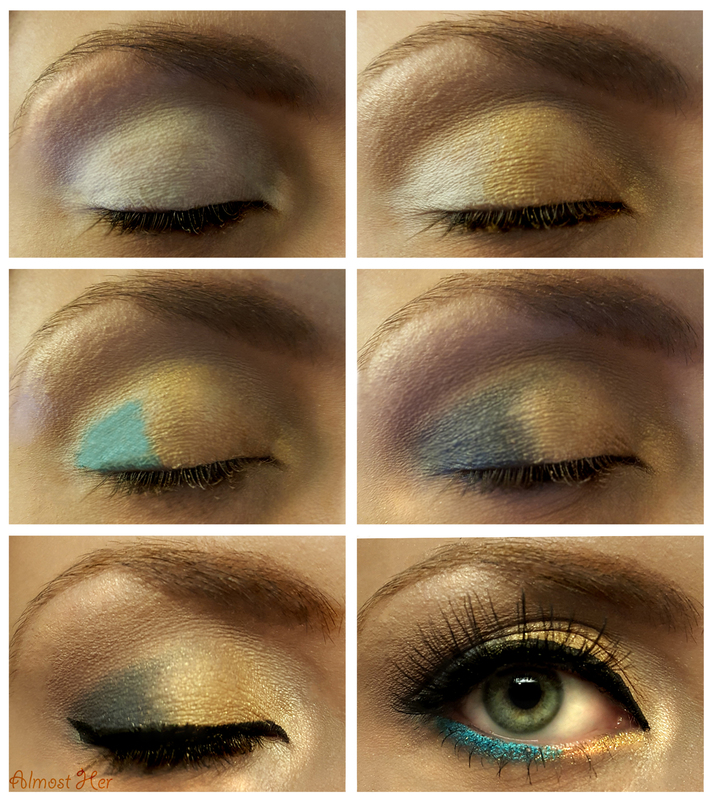 This is still a fun blue and yellow look that is easy to replicate! If you’d like to see a makeup look you don’t see much of, feel free to comment below on what you’d like to see me do next! =) Thanks for checking this out and hope you have a wonderful day!! 3. Take your white shadow base or white pencil (I used NYX Jumbo Eye Pencil in Milk) and fill in your lid just up to the crease. 4. 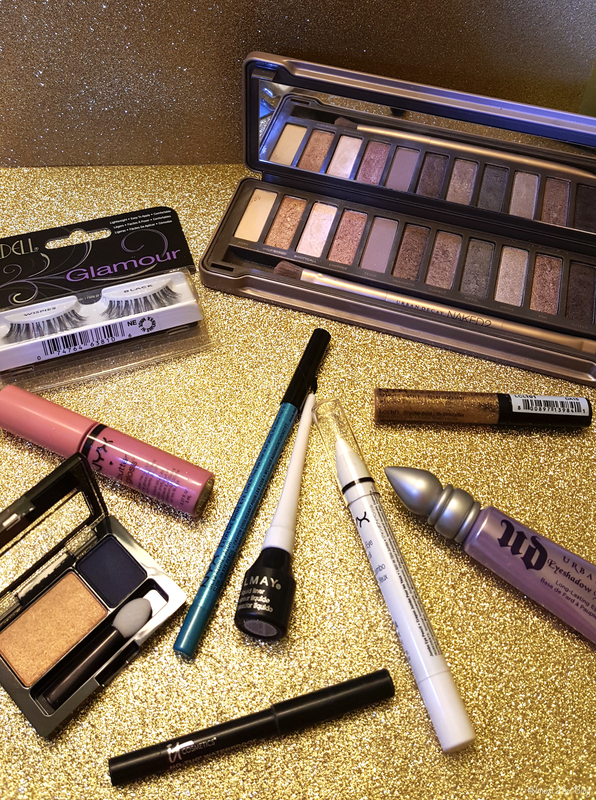 Take a gold color and apply near the inner corner of the eye, making sure to leave the outer corner alone. Mixing the gold and the blue colors will give you more of a green color, which we don’t want! We want them separate and bold. 5. Use a blue eyeliner to draw on the outer V and follow that with a dark blue eyeshadow for definition. 6. Take a pale brown matte (I used UD’s Tease) and a fluffy brush to blend out the crease and create a more polished look. 7. Apply a light shimmery cork color just under your eyebrow (on the brow bone) and also on the inner corner of your eye for a highlighted effect. 8. Line the top of your eyes with a smooth black eyeliner and just the waterline on your lower lashes. 9. On your lower lash line apple a blue eyeliner (I used NYX Azure) and a glitter gold liner for an added pop of sparkle and color! the final section 🙂 I maintain such info much.